Senior girl from Hobart High School poses on the bleachers at the baseball field. Brittany braved the cool temperatures and gale force winds for her senior picture session at the Hobart Lakefront. We also stopped by the high school where we did various shots on the baseball field as well as the above image on the bleachers. We had a lot of fun despite the winds whipping her long hair around. I teased her that it could start snowing at any minute because, well, it's Northwest Indiana and that's just how we roll. Hobart High School Senior poses against the graffiti wall overlooking Lake George. If I'm shooting high school senior photos in downtown Hobart, you can bet I'm going to use the graffiti wall over by the clock tower. While I like to avoid the cliched shots, this wall just screams 'senior pic'. The bridge over the lake is also a great spot. Senior girl poses on the bridge over Lake George in downtown Hobart. Cool locations are important, but getting some pretty close up shots are essential too. We had wonderful diffused light coming through the clouds along with the super soft lighting we bring along with us. A soft focus close up shot of a high school senior in Hobart, Indiana. Our final stop of the session was the baseball field at the high school. In the image below, Brittany's mom was holding a gigantic umbrella over her daughter with winds strong enough to pick her up and take her to another town. Thankfully that didn't happen!! We did some creative lighting and turned this late morning image into more of a night time shot for a cool effect. Hobart high school third base player poses for her senior picture on the pitcher's mound. 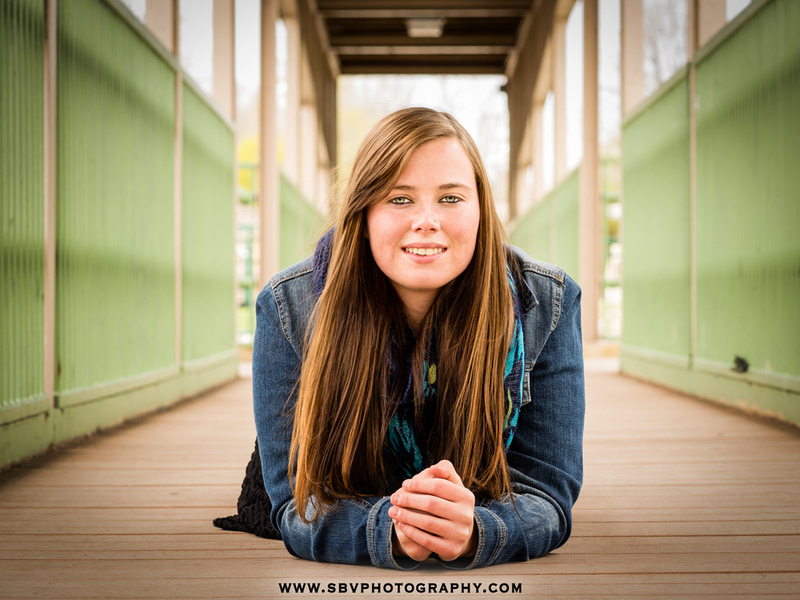 I hope you have enjoyed this sneak peek of Brittany's senior pictures at Hobart High School and the lakefront. Many more images to come along with a night time session scheduled for next week. Stay tuned here and on the SBV Photography Facebook page for more updates.